The 90 Day Music Licensing Challenge officially started Jan 2nd, 2013. I received an email containing my login/password aswell as a run down of how the course operates. I wasn’t able to dive into the course at the time, so I just checked to see if everything worked (if I could access the course etc). After giving the course a quick glance, I contacted Aaron to schedule my initial consultation. We were able to set one up for Jan 4th, (2013) 12pm EST. The consultation went well, I was able share my experiences (good and bad) as well as what type of production I was most comfortable with. What I loved most was Aaron’s honesty, his answers were unbiased and made good business sense. I also liked the fact that Aaron was humble, he didn’t come off as a know it all he was just… a normal person. After the consultation, I went over to the main training section of the course. The layout is pretty simple, there is a list of tutorials that tell you everything you need to know to get started with licensing music as well as bonus interviews, checklist sheets, directories etc. The guy pretty much put his blueprint in video tutorial format and there are daily emails which contain leads where we can send our music (which I’m 4 days behind on). I’ll be creating a brand new demo for these leads. Why? Eh, like I said before the start of this case study, I’ll be starting from scratch. Now, I’ll be using a basic production setup for this challenge and when I say basic… I mean basic, just a laptop, midi controller, 1 application, audio interface and a pair of headphones etc. Everything listed below can fit in a backpack, and that’s vital because I need to mobile. My best ideas come to me when I’m outside of the recording studio. Akai LPK 25: I got this controller as a gift in 2010, it’s not the “best” midi controller as far as user feel or features, but it’s perfect for what I need it for – Which is creating music. Akai LPD 8: Much like the Lpk 25, but instead of keys it has 8 pads. Wasn’t sure if I wanted to lay out my drum patterns with keys or pads, so I chose both. 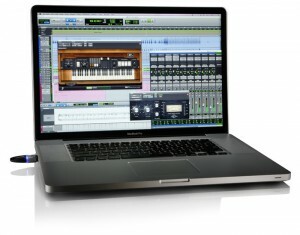 Saffire 6 USB: I like this interface because of it’s “sound quality” and it’s affordable. Most interfaces of this quality grade cost an extra $100.00 sometimes even more depending on what you’re looking at. The preamps on Saffire 6 are the exact same preamps used on their higher end interfaces. This is great because most interfaces skimp on the quality of their pres (especially in this price range). Beyerdynamic DT770: I love these headphones because I can trust a mix in them. They’re comfortable, flat response and I can use them for long periods of time with no ear fatigue. VrmBox: I’m tossing this in the mix because it allows me to reference my music on different speakers (emulated of course) and it fits in my pocket. These tools are important to me because I plan on mixing all of my material. Yes, it would be easier to pay someone else mix, but that can get expensive real quick… Not interested. All we need is broadcast quality, which is pretty easy to achieve without using huge mixing consoles or a professionally treated environment. Propellerhead’s Reason: Why Reason? I choose Reason because it has everything I need to create and it’s limitations actually keep me focused. I love using plugins (a lot of cools out there), but I find myself doing a lot toying around and experimenting rather than creating. Some will argue that experimentation is good and it is,experiments can yield some great results, but when I need to get work done I must be focused. H1 Zoom Recorder: This is not a need, but more so a luxury or convenience. In my 2013 Business Goals post, I stated that I wanted to do more field recording, and this is a perfect way opportunity to knock out 2 birds with one stone. Now Give Me Some Feedback! What are you thoughts? What kind of setup are you working with and what are you looking to get out of this case study? Aye Greg…Im also doing the 90 day challenge and I owe it to you for putting me on game. However I’m just starting down this road, so I too am in the same boat ie…starting from scratch. Is it possible for you to share with me how you go about putting your production demo together? As I have tons of music, just need help in organizing. Any input would be great and keep up the good work. Good luck!! I’ve I’ve shared this throughout the my case study, but I keep it very simple. 3-5 tracks, that’s really all that’s needed. That’s all I do. This is crazy I just purchased that audio interface the other day. How long have you owned it and do you think it’s good for recording vocals? I also noticed you didn’t list a condenser mic in the setup does this mean you’ll be using the Zoom for vocal recordings? as stated in the post, since 2010. Yea the preamps on it are lovely. No I didn’t list a condenser mic as I’m not a vocalist, I stick with instrumentation 100%. The H1 Zoom is just to capture sound (no vocals). I love what you’re doing here. I’ve been having issues trying to get my music placed in film. Recently stumbled upon your youtube videos (very helpful) and now this.. THANK YOU. Joined the email list as well, keep me updated. This is nice of you, can’t wait for the next update. Thank you for this, I’m so glad I stumbled upon you, you’ve already been a huge help in getting started. Looking forward to being on your mailing list. I’ve been more in the composition area and missing out on the licensing part. I too am unclear on how the final product should look (demo). Is there anyway you could show an example to see/listen? Thanx again! I’m not sure where you started in this case study, but I give a clear view/explanation of my demo. Technically your demo can be as many or as little tracks as you like. I personally like to keep it in the range of 4-7 tracks. Awesome post greg. The vrm box sounds great and I hope to get one when i have the money. Im also really inspired to get a mobile setup like this going, thanks again! Thanks for even being here, doing this. I’m needing a way to kick myself into financial independence, and it has been hard to find mentors around here (Houston Tx). I’ll be following all this closely, but more importantly, putting these things into action. I’m sorry, but I don’t pitch or manage artists, groups or composers. Love your walk through licensing. It seems to me this is the only realistic way to make a buck as a recording artist. Am I wrong?